I wish I had the time to share the recipe of the lemon verrines I made for us tonight, but unfortunately, I can’t–I have pages of drafts almost ready. I thought I’d still share this image though, wishing you all a lovely time whether you are cooking at home or going out. I am one of those who will cook tonight. You too? We’ll have fish en papilotte with shaved vegetables and ginger, a recipe inspired from my own cookbook (isn’t this funny?) and black rice. I will also prepare a multi vegetable salad to start our meal (oh you’ll love this one when I come back to tell you about it) and then we’ll have this dessert. I cannot wait for diner time to come! We’ll wait anxiously — I mean patiently — for the recipe. Happy Valentine’s Day! It looks so yummy! Have a great time with your family…Happy V-day! Bea, what a lovely and bright recipe- you have a truly beautiful site! I’m a first time visitor and so glad to have found your lovely space here; I look forward to returning to experience more of your wonders! It’s alright, we can wait. After that photo, I think we can ALL wait! Lovely verrine! I hope you will have a wonderful and delicious dinner. Pages of drafts??? Does that mean another cookbook is in the works?? Hope so, because I am totally in love with your first! You’re not the only one cooking on Valentines’s Day. It happens to be my husband’s birthday as well. So I am happily preparing for my family! That sounds like a menu served at a Michelin star restaurant! Look forward to the recipe. La tarte au citron en verrine, une idée superbe que je vais mettre en pratique bientôt! I made my family a lovely dinner last night & used many of the recipes from your book. The blood orange salad with avocado/pistachios was the highlight of dinner and we enjoyed the chocolate hazelnut molten cakes for dessert! It was so nice to have this new cache of gluten free recipes to try out! Thx to you and you wonderful cookbook (that I got as a present for my birthday!!) I cooked a very nice St Valentin diner (goat cheese clafoutis , then salmon in carrot sauce). This verrine would have been perfect as a dessert. I’ll try next time ! Lovely photo! Another reason to take advantage of the local Meyer Lemons here! Le citron nous fait oublier l’hiver et nous fait rêver à la douce saison avec ses terrasses, ses après-midis ensoleillés et ses rêveries sous les arbres. Lemon is fantastic – just a little and you have great moments! Thank you! This looks terrific! I’m a first time visitor and am looking forward to many more visits! On veut la recette Beatrice ~!!! En francais si possible. Ca a l’air trop bon !!! Bea, where do you find all your beautiful colorful spoons? It is very late at night, and I after seeing your book that I got today got out of bed and went into the kitchen. The book is wonderful, and I just finish bake chocolate cake with a bean. Thank you for this recipe and for the book. Lo, very pleased. Many thanks. I hope you like it! Cela fait des années que je lis ton blog et j’ai finalement commandé ton livre. J’ai très hâte de le recevoir. Félicitations! Hi Bea! I follow your blog for some time and I love it! I just got your book. It is wonderful! I cook in a small restaurant in Catalonia and will be a great inspiration to me! Congratulations! Many thanks. I am so pleased to hear. Happy cooking to you. Would love to one day visit Catalonia! Merci Helene. J’espere que tu aimeras! These spoons were bought in France a while ago. Don’t remember the brand name but will try to find out. A real joy to visit your site, photos are so beautiful! Ahhh, I can’t wait for this recipe, it looks so incredibly yummy! Votre livre magnifique est arrivé à Amsterdam et c’est vraiment trop beau avec toutes les couleurs vivantes et les belles photos! On peut déjà gouter les recettes juste en regardant… Je crois que j’ai presque essayé la moitié, et mon ami adore le buckwheat and almond chocolate cake beaucoup-beaucoup! Merci pour cette découverte géniale Béa! I just received your cookbook. What a beautiful piece of work. I’ll have to find the ingredients that I don’t normally have in my pantry. My brother-in-law is celiac and I want to bake him some sweets when he comes home. I hope that I can find something sweet in your book that will satisfy his taste buds. Bea, thanks for your reply and trying to find out about the flatware. I saw many pics online for those beautiful spoons and forks but the links don’t work or whatever. (Not the Sabre ones.) Thanks again. And, I love your book! I already made 5 recipes and more planned for this upcoming week! Going to post a review on my blog soon. I am truly inspired! The book title is so right. Bea, I just received your lovely cookbook and was wondering if there were any references you could provide for all the beautiful dishes you use. WAW. You make my long for spring. Catina, many thanks. I don’t have references as such, but if you have questions, just drop me a line. I’d be happy to help, if I can. Nurit, thank you 😉 Making me very happy to read. Hélène, merci beaucoup. I hope you’ve found something that he enjoyed! J’ai découvert ton blog l’an dernier et il me fait rêver. Lorsque j’ai su que le livre sortait prochainement, j’ai eu très hâte de le découvrir ! Merci beaucoup Christelle, je suis touchée par ton message, et très contente de savoir que mon livre te plait. Vancouver est un bien bel endroit que j’ai aussi hâte de découvrir. As ever this looks wonderful. I hope you don’t mind – I have nominated your wonderful blog for a Versatile Blogger Award. Juste superbe !!! Mon dessert préféré revisité ^^ . Grand MIAM de France ! Could you tell me where to get the plastic colorful spoons in your picture? I’ve been finding it. Thx. Now this actually looks delicious and mouth-watering. I am in love with lemon and this is making want to give it a try to make something similar or make some lemon pies. The spoons is very cute and colorful, love it. 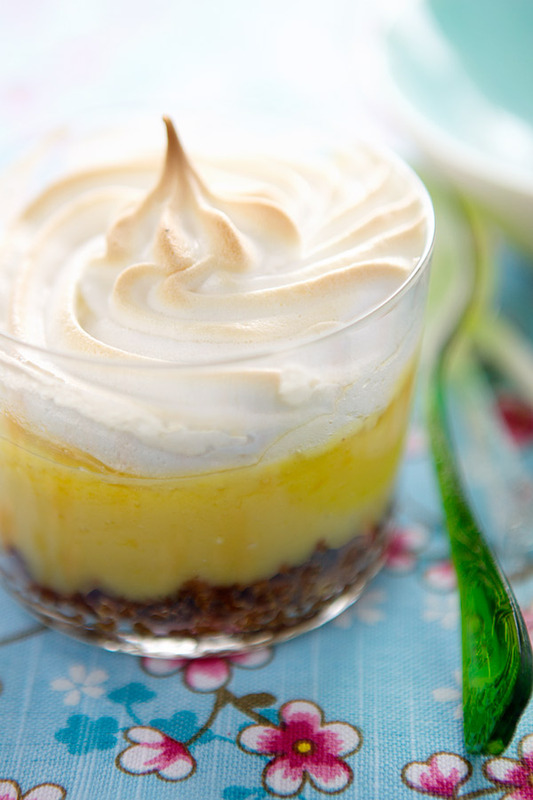 This lemon verrines looks so good. I hope you’d share the recipe some day. My heart leapt when I saw this post as I love lemon so much. I was broken-hearted not to find the recipe with the post…Please share as soon as you can! This looks outstanding! I love this recipe and pics too! thanks. I am needing to find a good camera to take food shots…what kind do you have? Thanks! You have the most beautiful pictures and lucious recipes.